This installment is about SDRs, about inductors, capacitors and antennas, and starts with a strange modulation type. When studying for an amateur radio license, one learns about several modulation types, in particular amplitude modulation (AM), frequency modulation (FM) and single-sideband modulation (SSB). SSB saves bandwidth in comparison to AM by omitting one of the two sidebands, because they contain identical information anyway. With FM, there are also sidebands on either side of the carrier. Does that mean one could make a single-sideband version of FM? Indeed, in the 1960s research has been done into "SSB FM". That was not done by taking a normal FM signal and filtering one sideband, but by simultaneously modulating the carrier's amplitude and frequency. This method was invented in  based on a mathematical analogy with "normal" SSB. 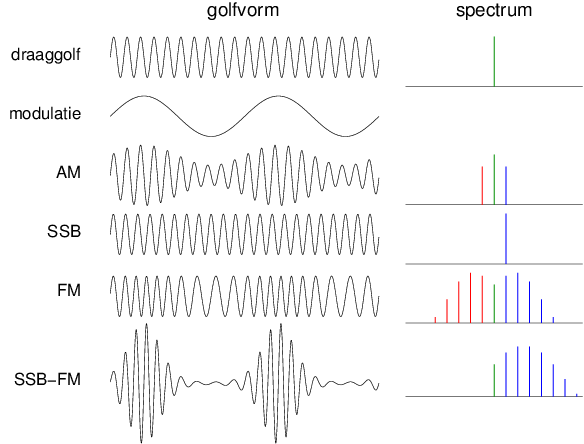 Let's compare the different forms of modulation. The top part of the figure shows an unmodulated carrier, both in the time domain (the sine wave) and in the frequency domain (the spectrum diagram at the right). Just below this, the modulating signal is shown, in this case a slower sinewave. Below this, AM and SSB are shown; the sidebands have only a single peak here because the modulation is a pure sinewave. Next is FM: we see that the amplitude is now constant, but the frequency varies: in the peaks of the modulation, the frequency is highest, in the valleys it is lowest. The spectrum is more complicated: even with a pure sinewave as modulation, there are multiple components in each sideband. At the bottom, single-sideband FM is sketched. If one looks carefully, one sees that the frequency varies here exactly like with normal FM. Much more noticeable however is that the amplitude is also varying: in the modulation peaks the amplitude is high, but the signal disappears almost completely in the modulation valleys. This amplitude modulation is not linear, but is performed via an exponential function; that explains why the envelope is no longer a nice sinewave. In the spectrum we see that the lower sideband is completely gone, but the upper sideband extends even a bit further than with normal FM. Can we intuitively understand what happens with SSB-FM? The effect of the amplitude modulation is clear: in the valleys of the modulation, the amplitude is reduced quickly; this is when the frequency would be below that of the carrier itself, i.e. in the range of the to-be-suppressed sideband. In the peaks of the modulation, the frequency is on the "good" side of the carrier, and the amplitude is increased. Intuitively, this already suggests that the upper sideband will be made stronger and the lower sideband weaker. By modulating frequency and amplitude simultaneously, both modulations contribute to both sidebands. Both of these contributions add, and then it can happen that the AM contribution precisely cancels the FM contribution. If one does this precisely right (mathematically proved), all lower-sideband contributions cancel, leaving only the upper sideband, which however has become a bit stronger and wider. Is this SSB-FM good for anything in practice? Well, not really (otherwise, it would surely have found more use). SSB-FM needs less bandwidth than normal FM, but still more than "real" SSB (i.e., derived from AM). An advantage of SSB-FM is that it can be demodulated by a normal FM demodulator. However, a disadvantage is that during the valleys of the modulation the transmit power is almost zero, especially at large modulation index (deviation). Practically, this means that the valleys of the modulation will have a rather bad signal to noise ratio. In the 1970s, several Dutch amateurs (in particular PA0EPS) invented something related but different, namely "SSB-compatible FM", also called "phase-locked loop SSB" . This was made by sending a normal SSB signal through a PLL. The PLL then creates a signal with constant amplitude, whose frequency depends on the SSB signal. Thus, the signal only varies in frequency (so we can justly call it FM), but in a way which can still be listened to using an SSB receiver (hence "SSB-compatible"). The main purpose was to reduce interference to consumer electronics. When choosing a sound card for use as part of an SDR receiver, two aspects play an important roll: the dynamic range and the samplerate (cf. ). The dynamic range of the soundcard immediately determines the dynamic range of the SDR receiver: the difference between the strongest and the weakest signal the receiver can handle simultaneously. The samplerate determines the bandwidth of the receiver, i.e., how wide the spectrum or waterfall view will be. In the recent past, most PCs had simple soundcards with a samplerate of 48 kHz: good enough for audio, because one doesn't hear tones above about 20 kHz. Higher samplerates (96 and 192 kHz) and extra large dynamic range were available, but only as an extra soundcard, and quite expensive. Surprisingly, nowadays even cheap PC motherboards have a souncard on board with 192 kHz samplerate, and often separate, simultaneously usable, stereo MIC and LINE inputs. (On my own PC I only discovered this a year after buying it. The motherboard manual only says it has "High Definition Audio", without technical specifications.) And all of this while such a motherboard costs only about 50 euros, much less than a high-end soundcard. For that price the dynamic range may be a bit less good, but for SDR still quite usable. Most radio amateurs have an instrument to measure capacitances; they are integrated in many digital multimeters. Almost all such instruments have a knob for setting the readout to 0 before connecting the capacitor to be measured. This is needed to eliminate the contribution of the parasitic capacitance of the wires and connectors. However, there are also capacitance measurement instruments which do not need this, like the Meratronik E315A which I have been using for years. The principle of this instrument is shown in the figure; for now, ignore the red (parasitic) capacitances. 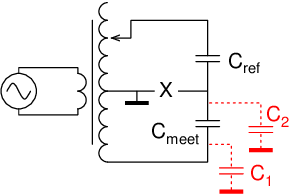 In fact, the circuit is a bridge circuit, with on one hand the unknown capacitor Cmeet ("meet" means "measure" in Dutch), and on the other hand a precisely known reference capacitor Cref. An AC voltage is applied from the left, via the transformer in opposite phase to Cmeet and Cref. On the other side, Cmeet and Cref are connected to each other, and the AC voltage here (i.e., between the points marked X) is measured. The tap on the transformer, connected to Cref, is set such that the measured voltage is 0: the bridge has been brought into equilibrium. Now let's assume that in equilibrium the tap on the transformer happens to be such that the voltage on Cref is twice that on Cmeet. Since the same current goes through both capacitors, we can conclude that Cmeet has twice as much capacitance as Cref. In other words: the position of the tap that achieves equilibrium tells us by how much we have to multiply Cref to find Cmeet. The nice thing about this circuit is that both (red) parasitic capacitors do not influence this. If C1 is not 0, then some current will flow through it. However, that will not affect the voltage on Cmeet and Cref, so C1 does not influence the measurement. And when the bridge is in equilibrium, there is no voltage between the points marked X; then the voltage across C2 is 0, so no current flows through it, so it will not influence the result. Thus, we can even connect the unknown Cmeet via two coaxial cables of which the shield is connected to ground! In just about all other capacitance measurement methods, one side of the unknown capacitor is connected to ground. The other side is then e.g. connected to a known voltage, and used to to measure the current. Any parasitic capacitance to ground is then in parallel to the unknown capacitor and will influence the measurement. The Meratronik E315A is a Polish instrument from the 1970s. 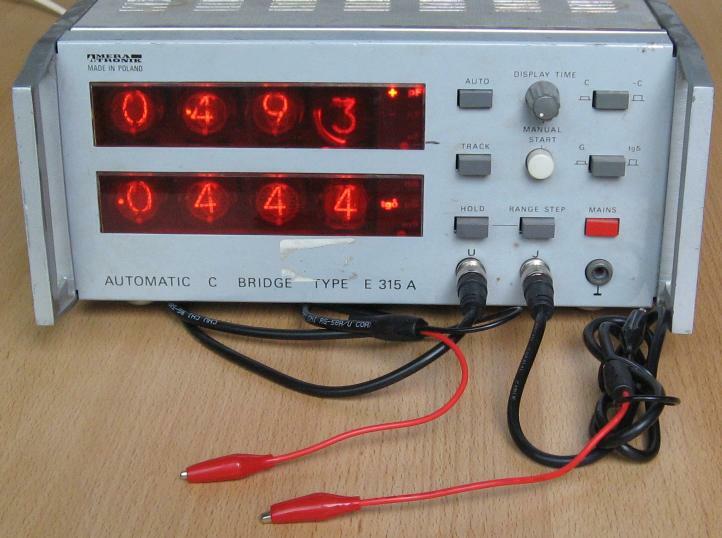 The photo shows the instrument measuring a capacitance of 0.49 pF between the two red test leads, connected via coaxial cables each of which has some 80 pF of parasitic capacitance. In this instrument, the variable transformer is implemented as a voltage divider which is switched using transistors. In fact, the instrument contains two such circuits; one for the reference capacitor Cref, and in parallel with this another one with a reference resistor, to also measure the leakage current (or "tangens delta") of the unknown capacitor. Bringing the bridge into equilibrium is done entirely automatically, using a whole bunch of digital logic, and the measurement result is also displayed digitally. Note that the connectors for the unknown capacitor are BNCs. Initially, I found this weird, but it turns out to be very practical to connect the unknown capacitor via coaxial cables. To make a dipole work on several bands, traps can be used: LC circuits mounted halfway the antenna wire, blocking a range of frequencies there. Thus, the wire is interrupted for that range of frequencies at that spot, while the rest of the wire continues to contribute on other frequencies. Usually, traps are made by connecting a coil and a capacitor. However, they can also be made by making a roll of coaxial cable, which will then simultaneously act as a coil (due to the rolling) and a capacitor (the capacitance between the center conductor and the shield). Thus, a separate outdoors and high-voltage proof capacitor is not needed. The top half of this figure shows how such a trap is wired. The signal in fact goes through the coil twice, namely once through the center conductor and then a second time via the shield. Thus 3 turns effectively produce a coil of 6 turns. We also see that the capacitance between the center conductor and the shield is in fact not connected across the entire 6-turn coil, but only between the 1st and 4th turn, betwen the 2nd and 5th, and between the 3rd and 6th turn. This needs to be taken into account when designing the trap. There is a computer program to do this, made by VE6YP . This principle for making coax traps has been known for a long time, but in , W6NBC describes two ways to make better traps. The first improvement is the use of coaxial cable with a higher impedance than the usual 50 Ω. Cable of 75 Ω is readily available (among other due to its use for TV antennas), and there even is 93 Ω cable (which once upon a time was used by IBM for computer networks). These cables have a larger distance between shield and center conductor, and thus less capacitance per unit of length. Therefore, in order to achieve the same resonance frequency a larger inductance is needed. This leads to a larger bandwidth over which the trap is effective, which can be seen as follows. The trap is meant to serve as an interruption of the antenna wire: the higher the trap's impedance, the more effective this interruption is. Exactly at the resonant frequency, the trap's impedance is (in principle) infinite: a perfect interruption. Outside the resonant frequency, the impedance is determined by the C and the L: a smaller C and larger L have a higher impedance, so a better interruption, so the trap works acceptably farther away from its resonant frequency. The second improvement consists in not winding the coil onto some former (e.g., a piece of PVC tubing), but simply roll the cable and bind it together. This is less heavy, and can still be made sufficiently sturdy, as W6NBC shows in his article . In his coax trap article, W6NBC observes that it doesn't really matter much how many turns one uses for the trap (or for a coil in general); the only thing that counts, is the length of the coax (or wire). He finds this after some experimentation with VE6YP's program. Let's try to reason about this. To start with: the inductance of a coil is directly proportional to the square of the number of turns. That can easily be explained. After all, what is (self) inductance? It is the phenomenon that a current going through a coil, produces a magnetic field in that coil, and that then this magnetic field induces a voltage into that same coil. Well, the magnetic field is directly proportional to the number of turns (because the magnetic fields of the individual turns simply add up), and the induced voltage is directly proportional to the both the strength of the magnetic field, and to the number of turns (because a voltage is induced in each turn, and those are connected in series, so the voltages add). Those two direct proportionalities together give a quadratic dependence on the number of turns. How the inductance depends on the coil's diameter is less simple. At the left, a straight wire (blue) is shown carrying a current, and the magnetic field lines around it (red). The farther away from the wire, the weaker the magnetic field is, indicated here using thinner lines. If we bend this wire into a loop, as shown in the middle figure, then almost all field lines go through the "hole" in the loop: they are "enclosed" by it. The total "number" of fieldlines is directly proportional to the length of the wire, and thus to the loop's diameter. The induced voltage, and thus the (self) inductance, is directly proportional to the number of enclosed field lines, and thus also directly proportional to the loop diameter. However, if the loop is made very small, as shown at the right, then there is another effect: some field lines are no longer enclosed by the loop, but pass "outside" the loop, and thus do not contribute to the (self) inductance. Thus, if we make the loop very small, the (self) inductance will be reduced extra quickly, because there are not just fewer field lines due to the shorter wire length, but also some of them no longer contribute. The threshold between a "large" and a "small" loop is of course not sharp; there is a gradual transition between direct proportionality and the stronger dependence. Taking it all together: if we keep the cable length the same, and double the number of turns, the diameter halves. 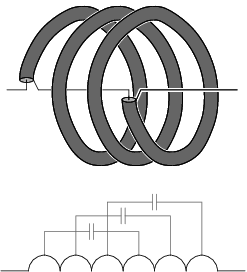 The double number of turns leads to a 4 times larger inductance, but the half diameter leads to 2 or more (depending on whether it is a "large" or "small" loop) times smaller inductance. So we see that both effects do not entirely cancel, but still partially, as was observed by W6NBC experimentally. Most active antennas for say 0 to 30 MHz consist of a short whip followed by an amplifier (or buffer) with a high input impedance (but see  for other forms). When I had built such an antenna for use at the WebSDR receiver at the University of Twente, it turned out that it was overloaded by local FM broadcast transmitters on 93.7 and 100.7 MHz, giving second-order intermodulation in the form of extra noise around 7 MHz. To prevent this, one would want to put a low-pass filter between the whip and the amplifier, but this is not trivial. The figure shows, at top left, a whip-with-amplifier ("spriet" being Dutch for "whip"). The whip itself essentially behaves as a voltage source in series with a small capacitor, and the input impedance of the FET amplifier is mostly determined by parasitic capacitances to ground. This leads to the equivalent schematic shown bottom left, in which we can recognize a capactive voltage divider. The challenge is to put a circuit at the place of the question mark which acts as a low-pass filter. If we would connect a regular pi filter at the place of the question mark, then the capacitors of this filter would be parallel to the input capacitance of the amplifier, reducing the output signal for all frequencies. Clearly, that's not good. The simplest solution is connecting a resistor between whip and amplifier. Together with the amplifier's input capacitance this gives a simple RC low-pass filter. This works well if one is only interested in long-wave signals, because then one can choose the filter's corner frequency quite low. But if one chooses the corner frequency at 30 MHz, then the filter gives hardly any attenuation in the FM broadcast band: see the red curve in the figure. Instead of a resistor, one can also connect an inductor. See the blue line: this results in a steeper filter, as desired, but also in a resonance with the two capacitances (of the whip and the amplifier input). This resonance results in a very high amplification around that single frequency, in this example about 25 MHz. This may be useful if one is interested in one band, but not for making a broadband antenna. To damp the resonance, we can reintroduce the resistor and connect it in series with the inductor: the purple line. The resistor damps the resonance; the larger the resistor, the lower the peak. This is already quite a useable result: while the antenna still works fine to 30 MHz, the attenuation in the FM broadcast band is over 20 dB. This can even be improved further: by connecting a small capacitor in parallel to the inductor, one can create a notch somewhere in the broadcast band, see the green line. I purposely do not give any component values, because those depend on the capacitances of the whip and FET circuit. The coil together with these capacitances determines the frequency of the peak; the resistor determines how much the peak is damped, and the parallel capacitor determines the notch frequency. To give an idea anyway: typically the input and output capacitances are on the order of pF's, the inductor then is several tens of µH, the resistor several kΩ, and the parallel capacitor less than 1 pF. So much for the theory. In practice, it is more complicated: because of the parasitic capacitance of the inductor, even the "purple" circuit can easily give the "green" curve, even with a too low frequency for the notch. One needs an inductor with a very small parasitic capacitance, i.e., a very high self-resonant frequency, in order to be able to move the notch down to the desired frequency by adding a bit of capacitance. I didn't have such an inductor in the junk box, but I did have one that didn't give a notch at all: apparently that one already had so much loss at 100 MHz that there was hardly any resonance. That one is now in use. "The Analytic Signal Representation of Modulated Waveforms", Edward Bedrosian, Proceedings of the IRE, 1962. See e.g. PA0SE's Reflecties & Technische notities, part 1, p. 170. "Making Better Homebrew Traps from Coax", John Portune, W6NBC, QST 2/2011. Text and pictures on this page are copyright 2013, P.T. de Boer, pa3fwm@amsat.org.